Grassfed Beef Ending in Argentina—But Reborn in the U.S. The Pampas of Argentina were once the finest cattle-grazing country on Earth. The lush grasses grew so high that they could cover a rider on a horse. This noble green grass was full of nutrients from the rich soil. Nutrients that sustained vast herds of some of the most magnificent grassfed cattle the world has ever seen. Grassfed beef was the most popular food in Argentina, often eaten daily. Grassfed beef became Argentina’s largest export. The Pampas are no longer green. Much of these once magnificent grasslands have been plowed under, and the land is brown with GMO soy. Soy is more profitable than cattle, and soy has become Argentina’s largest export. Nearly all Argentine cattle are destined for the feedlot, where they are fed GMO corn and GMO soy. 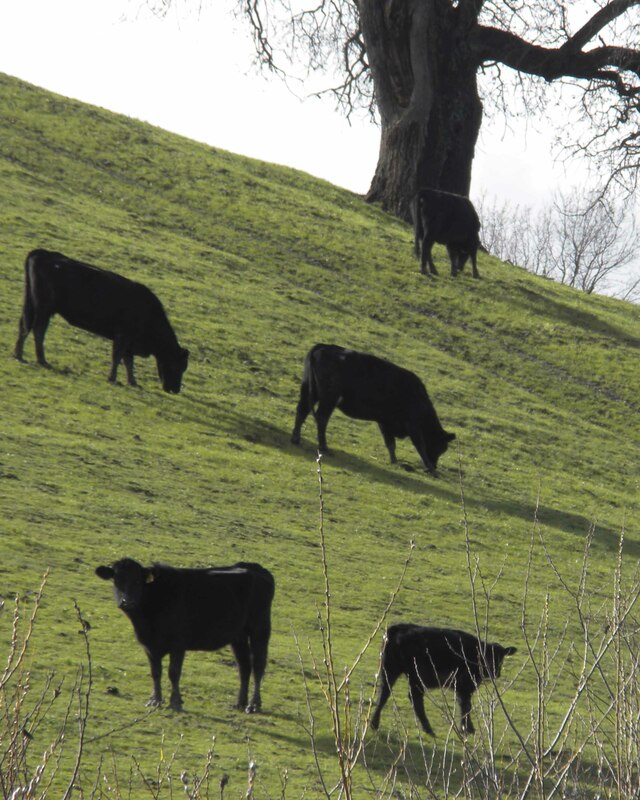 Most of the remaining grassfed beef is exported to Europe. One of the healthiest food traditions on Earth is dying with the Pampas, as it is now very difficult for Argentines to find the grassfed beef that was once their heritage. The land of rich grasslands has become the land of soy, to the loss of all humanity. Yet in the United States, a small but growing band of intrepid ranchers are bringing back the grasslands, using rotational grazing methods to restore the soil, and producing wonderful grassfed beef. Ever since I was a small boy, I was fascinated by the Pampas, which were an extensive area of rich, lush grasslands, located mostly in Argentina but partly in Uruguay. These grasslands were the home of huge herds of cattle that thrived on the tall, lush grasses. A sea of rich, green grass. Grass so tall that a mounted rider could hide in it. Grass that grew lush on some of the richest soil Earth has ever known. Grass eaten by cattle that provided some of the finest beef the world has ever produced. I read of the colorful gauchos, the Argentine equivalent of the American cowboys, fearless men who raised cattle in the Pampas. As I grew older, I read about the magnificence of Argentine beef and barbecue, and decided that I would go there someday to enjoy it. As a cook and cookbook writer specializing in grassfed meat, I was inspired by the Argentine tradition of fine grassfed beef, and was impatient to go there and learn about cooking grassfed beef at the source. Much of the Pampas is now plowed under and brown with GMO soy. Those grasslands are gone forever, the soil stained with pesticides. It took nature thousands and thousands of years to create the grasslands. Herds of migrating animals would graze in an area, breaking up the soil with their hooves, trampling seeds deep into the soil, fertilizing the earth with their manure. Then, the herd would move on, leaving the soil alone, to recover and renew. The seeds grew into grass, set down roots that held water in the soil, water that helped the grass grow, and nourished the microorganisms that filled the earth with life and nutrients. When the herd returned, they were greeted with rich green grass that nourished them, increasing their numbers, as they broke up the earth with their hooves, eating the older growth, depositing their manure, and continuing the cycle before they moved on. The earth and the grasslands rested and grew even richer grass. This cycle, repeated time after time, built the good soil and the grasslands. The herds renewed the soil and the grass fed the herds. The Pampas were one of the finest examples of this process, and the grasslands grew even richer when large herds of cattle were introduced. The herds nourished the earth, the grass fed the herds, and the herds fed the people. This glorious, sustainable cycle is being destroyed in the Pampas, replaced with GMO soy and pesticides. It took nature untold thousands of years to create the Pampas—it took humans only a few years to destroy them. I would never have believed it. Argentina, whose very cuisine was based on the finest grassfed beef, is now dominated by the feedlot. Writer after writer has reported that it is now almost impossible to find grassfed beef in Argentina, even at the finest restaurants. The land of the gaucho has become the land of the feedlot, and the grassfed tradition looks dead. One of the problems was the introduction of GMO soy to the Pampas. Much of the grasslands were plowed under and ruined for cattle. This reduced the meat supply. Another problem was the worldwide demand for cattle. The profits from exporting beef grew and grew. Argentine ranchers increasingly preferred to export their beef because of the higher prices. For the first time, the price of beef in Argentina itself became so high that many people were having trouble affording it. This led to great political unrest, as Argentines were outraged by the high price of domestic beef. The President of Argentina responded to the outrage by reducing exports and imposing price controls. The government also subsidized grain feeding of cattle to keep the price down. This had two terrible consequences. Even more ranchers converted their land to GMO soy production, because they could make considerably more money raising soy than cattle. More and more ranchers switched to the feedlot, so they could take advantage of the subsidies. By the end of 2010, almost all the beef available in Argentina came from the feedlot. The use of feedlots and grain feeding was developed in the United States, which resulted in the horrible factory beef that dominates the market. Yet the grassfed movement is growing. An increasing number of innovative ranchers are learning to raise and finish cattle, bison, and lamb on grass, and to avoid the feedlot. Many of these pioneers have studied Holistic Resource Management, and are using rotational grazing practices to rebuild the richness of the soil and grass. Some of them are enjoying great success, and the quality of grassfed American beef is getting better every year. This grassfed meat is so much more nourishing and so much tastier than the factory meat, there is no comparison. Once you have eaten properly cooked grassfed meat, there is no going back. I am blessed to be living in a time when I can support these noble ranchers and thrive by eating their wonderful meat. I no longer desire to go to Argentina. I can learn everything I need to know right here in the United States, thanks to these great ranchers. I have had the joy and privilege of eating wonderful grassfed meat from U.S. Wellness Meats, Northstar Bison, Humboldt Natural Beef, Chaffin Family Orchards, Homestead Natural Foods, Alderspring Ranch, Anderson Ranches, Bison Ridge Meats, Foxfire Farms, and others. My deepest thanks to each and every one of them. photo credit: conner395. 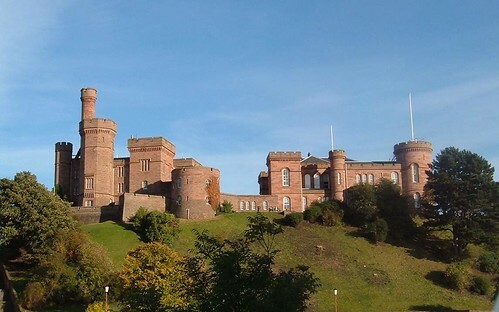 Inverness Castle in the Scottish Highlands, home of a healthy people. Old people in modern times are considered weak, foolish, and helpless, unable to survive without care. Most people expect to be weak and helpless when they get old, and to end their lives in a “rest home.” We often read in the news media that young workers will have the burden of taking care of an aging population. Yet this is a new and horrible way of aging. Through most of history, old age was associated with wisdom, strength, and leadership. Most older people who ate a traditional diet not only took care of themselves, but led their communities, taught the young, and were the repository of knowledge and leadership for their peoples. What is the difference? Why did old age change from a time of wisdom and leadership to a time of failing minds, deteriorating bodies, and chronic illness? What we do know is that people eating the healthy traditional diets of their ancestors, with little or no medical care, remained wise and strong into their nineties. We also know that modern people eating the Standard American Diet (SAD) become helpless in their sixties and seventies and even younger, unable to care for themselves, needing all kinds of expensive medical care and procedures just to keep breathing. In other words, real food is the key to a wise and healthy old age. Throughout most of history, old age was associated with strength and wisdom. Age was considered a prerequisite for leadership, and younger leaders always had older advisors. Every village, from England to Africa to the Americas to Russia to India to China, and almost everywhere else, depended on a council of elders, who would make decisions for the whole village, based on their experience and knowledge. It was accepted that these old people were the only ones who had the knowledge and experience to make important decisions. The knowledge of childbirth, cooking, what was safe to eat, and healing was usually taught and administered by the older women, who were universally respected. On a national level, many traditional societies had councils of elders who would make decisions for the whole nation or tribe. He was a nobleman, growing up on the finest food his culture could provide, eating huge amounts of wild game and grassfed meat. He commanded the Prussian Army at the battles of Ligny and Waterloo, in 1815. Blucher was 73 at the time. During the battle of Ligny, Blucher led a cavalry charge against the French. His horse was shot, throwing Blucher to the ground. The horse then fell on Blucher, pinning him to the ground. The opposing cavalry forces charged several times over the area, back and forth, which resulted in Blucher being repeatedly trampled by horses, sustaining many wounds from their hoofs. After the battle, the horse was pulled off Blucher. Blucher poured brandy on his many wounds and drank some, and recovered in a few hours. He reorganized his defeated army and led them to Waterloo, a couple days later, where the sudden appearance of his army on the French flank helped the Allies win the battle. He was a Highlander, growing up on a traditional diet that had not changed for thousands of years. At age 57, he took part in the rebellion of Bonnie Prince Charlie, and fought in the battle of Culloden in 1745, wielding a heavy broadsword. Macpherson blamed the French for the Highland defeat. When Britain went to war against France some years later, Macpherson joined a Highland regiment at age 70. He fought the French in North America, using his heavy broadsword so effectively in hand-to-hand combat that he was taken to England to meet the king. It should be understood that the above examples of robust old people were not unusual, and old people were expected to carry their weight and take part fully in all the activities of life, no matter how difficult. Dr. Weston A. Price studied healthy peoples eating the diets of their ancestors. The elders of these people kept their teeth and their eyesight, leading active productive lives without illness or doctors. They did not live in fear of chronic diseases like cancer and heart disease—these illnesses did not exist in their societies. In fact, studies of the healthy peoples eating traditional diets have repeatedly found that most people remain healthy and productive into their nineties or even longer. They will usually slow down at some point, where they become consistently less active for a period of several months, then die in their sleep. These healthy peoples ate plenty of fat from grassfed animals and wild game, fatty meats, seafood, organ meats, butter, all kinds of animal fat, organic fruits and vegetables, and did not touch modern processed foods. Old age has become a time of sickness and horror for many people eating a modern diet. Most old people are on a number of prescription drugs, and eat a diet of refined foods that does not support the functions of their bodies. Most of them are impaired in their ability to do most things and many are completely unable to care for themselves. There is no wisdom in many of these people—many of them cannot remember what they said one minute ago. Many cannot walk unaided, and have bones so brittle they break easily. Many have had one or more of their hips and or knees removed and replaced with an artificial construct. Many are emaciated, suffering from severe malnutrition, which makes all their symptoms worse. Many live each day in a mental fog, and do nothing useful with their time. Many have actually shrunk in size, as their bones deteriorate and collapse. Many have lost all their teeth, and rely on dentures. Many start to die as their organs stop working, suffering from problems with their hearts, livers, kidneys, digestive systems, and just about everything else. Every function of our bodies requires proper nutrition in order to work effectively. When our bodies are starved of the vital nutrients we need, our bodies deteriorate. The longer we are starved, the faster and more serious the deterioration. We are told that this deterioration is the inevitable result of old age. However, it appears to be a result of decades of malnutrition on the nutrient-poor modern diet of dead, refined foods. History and the great research of Dr. Price have shown us that a diet of real, traditional food can save us from this horror. The Dietary Guidelines of the Weston A. Price Foundation are a great place to start. Saint Patrick’s Day is the ultimate Irish holiday. Ireland produces some of the best grassfed beef on Earth. The excellence of this beef is most gloriously set forth in the form of majestic roasts and thick steaks. Yet Saint Patrick’s Day in the United States is celebrated with corned beef and cabbage. This corned beef is usually a highly processed product made from factory beef. This injustice cannot stand. This recipe celebrates the most legendary cut of Irish beef, in a marinade rich with green vegetables and green olive oil, crowned with the magnificent flavor of traditional Irish whiskey. Ireland has always been a paradise for cattle. The rich soil and the wet climate have produced some of the greenest grass ever to grace the Earth. Ireland is so famous for its beautiful green landscapes that it is known as the “Emerald Isle,” and the color of the nation is green. The Irish tradition of raising fine grassfed cattle goes back thousands of years. The old stories make it clear that the most prized cut of beef was the chine, also known as “the champion’s portion.” This cut was reserved for the best warrior, and some of Ireland’s greatest warriors fought to the death for the honor of being served this revered piece of meat. What is the modern equivalent of this dinner of champions? Grassfed prime rib, of course. Fortunately, we do not have to fight anybody or anything to enjoy this wonderful meat, except the always high price and some misinformed processors who trim off every bit of the magnificent fat. Most of the beef raised in Ireland is still grassfed, and I have read it is magnificent in taste and a very satisfying thing to eat, indeed. While I do not have access to Irish beef, grassfed American beef works perfectly with this recipe. 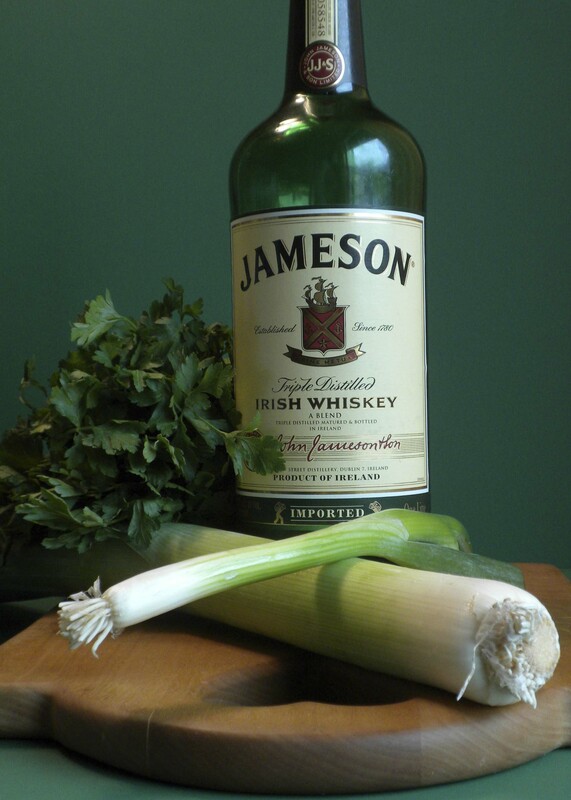 Green is always associated with Saint Patrick’s Day, and every ingredient in the marinade is green, except the whiskey, and the plants that the whiskey was made from were green once, too. 1. The day before you plan to cook the roast, make the marinade. Combine all ingredients and mix well. Place the roast in a large glass bowl. Cover all surfaces of the roast with the marinade. Cover, and let rest at room temperature for 1 hour, then refrigerate overnight. 2. Remove the roast from the refrigerator at least 1 hour before you plan to cook it, so the meat can come to room temperature. 3. Preheat the oven to 425 degrees Fahrenheit. When the roast is at room temperature, brush most of the marinade off the roast. Sprinkle the sea salt over the meat. Place the roast in a shallow pan large enough to hold it, bone side down. Cook in the preheated oven for 15 minutes. 4. Baste the roast with the drippings, and cook for another 15 minutes. 5. Turn the heat down to 250 degrees. Baste the roast with the drippings. Cook for another 15 minutes. 6. Baste the roast with the drippings, and cook for 15 minutes more. Test the roast for doneness. If the roast is not done to your taste, continue cooking at 250 degrees, testing for doneness at 10 minute intervals. This is a great roast to celebrate Saint Patrick‘s Day. Tender Grassfed Meat contains a recipe that provides yet another delicious way to celebrate this holiday with grassfed beef, entitled Irish Whiskey Steak. A meat shortage is coming. I hear this a lot from butchers and ranchers. The price of meat is already rising. The demand for meat is much greater than the supply, and the supply will not increase because of the rising price of corn. You would think that corn is necessary to raise livestock. Corn is not a vital part of the diet of cattle, bison, or sheep. In fact, corn is an unnatural food for all of these species, which were designed to thrive on grass. My solution to the corn shortage is simple—let them eat grass. The price of corn has been rising steadily in recent years. This has resulted in record corn crops, but the increased supply has not lowered prices. Why? The answer is ethanol. The United States government supports the production of ethanol as an alternative fuel. Many other countries also favor the use of ethanol. While ethanol could theoretically be made from any plant matter, the U.S. has decided to support ethanol made from corn. Many farmers and large agricultural operations now grow corn solely for the purpose of making ethanol. These farmers invariably use massive amounts of artificial fertilizer, which requires substantial amounts of oil to produce and transport. The profitability of making ethanol has led to huge profits. It has also caused the cost of corn for animal feed to skyrocket. The use of corn for ethanol is blamed for a substantial increase in food prices all over the world. The increase in the price of corn has made it much more expensive to raise animals in feedlots. Corn is an important component of the feed given to animals in feedlots, along with soy. The whole feedlot process is dependent on corn. The feedlot system was developed to make it much cheaper to raise and fatten meat animals. Cheap corn raised on artificial fertilizer was the basis of the whole system. The feedlot system came about as a result of World War II. The war caused a huge demand for explosives, which created a number of large companies to fill the demand. These large and wealthy companies faced ruin when the war ended, because the demand for their product was greatly reduced. A plan was devised to use explosive products as artificial fertilizer. Farmers were sold on the idea that artificial fertilizer would enable them to grow huge amounts of corn. Of course, a market had to be found for all that corn. The feedlot system was the answer, as it was found that cattle could be fattened much faster if they were confined to a pen and fed huge amounts of corn. The U.S. government supported the new system with subsidies, and nearly all meat production in the U.S. was quickly switched to the feedlot system. Meat became cheaper and more abundant, and profits became higher. But there was a hidden price—grass eating animals like cattle and sheep were not designed to be stuffed in a stall for six months, eating corn. They were designed to graze on grass and meadow plants. Large amounts of antibiotics were used to keep them somewhat healthy. The corn growers used massive amounts of pesticides and weed killers. These poisons, along with the artificial fertilizers, killed much of the life in the soil, depleting its mineral value. Corn feeding in feedlots, later supplemented with soy and other unnatural feeds, greatly reduces the nutritional value of the meat. Eatwild.com has an excellent description of this process: Health Benefits of Grass-Fed Products. The taste and texture of the meat were also affected, as feedlot meat lacked flavor, was watery, and had a mushy texture. The industry dealt with this problem by an intense marketing campaign designed to convince the public that corn feeding resulted in better meat. This campaign succeeded, and it became almost impossible to find beef that was not finished in a feedlot. Cooking techniques were invented to deal with the watery, flavorless meat. The very knowledge of how to cook grassfed meat was lost to most Americans, and most ranchers lost the knowledge of how to raise tender grassfed meat. The traditional ways of raising grassfed meat used by humanity, developed and perfected over thousands of years, were almost completely abandoned in the rush for profit. Now the very heart of the feedlot system—cheap feed—is being threatened by the high price of corn. In the long run, this may be a blessing in disguise, as grassfed meat is a far superior food, and proper grassfed ranching restores the land, rather than depleting it. Grassfed beef, grassfed bison, and grassfed lamb have the proper balance of nutrients that our bodies expect. Grassfed meat shrinks much less in cooking, has much more flavor, satisfies the appetite, and can be very tender if properly cooked. Raising and finishing grassfed meat requires no corn. It requires grasslands and skill. Many ranchers have rediscovered how to raise terrific grassfed meat. There are huge amounts of unused grasslands in this country that can be used for grazing. In fact, proper rotational grazing actually restores and enriches the land. Innovative ranchers in this country have been successful in increasing the richness of their soil. See Grassfed Farmer Renews the Land. Cooking grassfed meat also requires knowledge and skill. That is why I wrote Tender Grassfed Meat. Cooking tender and delicious grassfed meat is actually simple, and it tastes so much better than the feedlot variety. I call on all ranchers to learn how to raise grassfed meat, drop the feedlots, and free themselves from their dependence on corn. This post is part of Real Food Wednesday and Monday Mania blog carnivals. You may have heard about the longevity and health of the Okinawan people. According to records kept by the Japanese since 1879, the people of Okinawa just may be the longest-lived people in the world, often staying healthy and active into their nineties, or even longer. Many have claimed that this longevity and health is due to a low-fat, meat-free, high-vegetable diet. Being skeptical of such claims, I researched traditional Okinawan cooking and traditions. Okinawan cuisine is centered around meat. The most important meat is pork. The Okinawans have a saying, that they use every part of the pig except for the toenails and the squeal. Many of the pork parts eaten are composed almost entirely of fat, such as pork skin, pig ears, and pork belly. All the internal organs of the pig are regularly eaten, such as the liver, kidneys, stomach, and intestines, which are also full of fat. Pork lard is the fat of choice for cooking, and many foods are deep fried in pork lard. Every other part of the pig is also eaten, including more familiar parts like spareribs, pork shoulder, and pork loin. The skin is usually left on and eaten whenever possible. Goat is also favored by Okinawans, though pork is far more common. What is interesting is that much of this goat meat is eaten raw, and there are restaurants that specialize in the preparation of raw goat meat. Traditionally, the Okinawans ate very little grain, which used to be sold to pay taxes. Sweet potatoes are a common and favorite food, as are cabbages, carrots, and other vegetables. Vegetables are always cooked, often fried in pork lard. The Okinawans do eat tofu, but the tofu they eat is different. It is made differently from the rest of the tofu in the world, and is often naturally fermented for several months. Unfermented tofu is often deep fried in pork lard. One of the most common Okinawan dishes is a stir fry made out of pork, vegetables, and tofu, fried in pork lard. It is possible that the protective factors in the pork lard prevent the harm that often occurs from eating soy. Miso, another fermented soy product, is also used as a seasoning. Okinawans do not eat that much seafood, which is surprising given that Okinawa is a relatively small island. 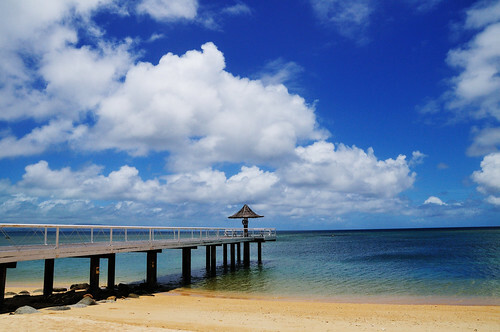 The explanation is that Okinawa has a tropical climate, and fish spoil very quickly. The island has very rugged terrain, which made it difficult to transport fish before they spoiled. Fish are fermented and made into sausages, which form a small, but important part of the diet. Most Okinawans do not eat western-style processed and refined foods, though a small amount of brown sugar is used in cooking. Traditionally, Okinawans had no medical doctors, but relied on food to heal themselves. This system was based on the organs of animals, usually pigs, but often goats. The traditional belief was that disease was caused by an imbalance in an organ, and the imbalance could be corrected by eating the corresponding part of an animal. Someone with breathing difficulty would eat the lungs of a pig. Somebody with a hearing problem would eat the ears. Someone with a digestive problem would eat the stomach of a pig, and/or the kidneys, and so on. This system is not unique to Okinawa. It was followed by many traditional peoples, including the Native Americans, and by many Western M.D.s before prescription drugs became the remedy of choice. This system worked so well that many Okinawans still follow this tradition, and do not seek medical help. This may actually contribute to their longevity, because the side effects of the drugs and surgeries used by modern medicine cause the death of many people. They ate a large amount of animal fat. They ate a substantial amount of meat and/or seafood. They ate a large amount of organ meats regularly. They ate some of their meat and/or seafood raw. They ate many kinds of natural foods, unrefined and unprocessed. They ate a number of naturally fermented foods. They ate at least a small amount of seafood, fermented if they could not get it fresh. All of these factors are present in the real Okinawan food. The Okinawans eat a great deal of pork fat. The Okinawans eat a substantial amount of pork and goat. The Okinawans eat organ meats regularly. The Okinawans eat raw goat meat. The Okinawans eat most of their food unrefined and unprocessed. The Okinawans eat a number of naturally fermented foods. The Okinawans regularly eat a small amount of fermented seafood. In summary, the diet of the Okinawans is very similar to the diet of the healthy peoples studied by Dr. Price. The longevity of the Okinawan people is further evidence of the benefits of the diet developed by Dr. Price. This post is part of Real Food Wednesday , Fight Back Friday and Monday Mania blog carnivals.